Fifteen students from the California Academy of Mathematics and Science participated in the 2015 Sequoia Forestry Challenge, one group among 88 high school students from nine schools in California. The event was Oct. 7 to 10 at Clemmie Gill School of Science and Conservation and Mountain Home Demonstra-tion State Forest, above Springville, CA. The three teams from CAMS placed second, fifth and tenth out of a field of 19 teams. Students spent two days at Mountain Home Demonstration State Forest collecting data on woody debris in an area that was recently logged. They used their data in a fire behavior computer modeling program to determine optimum conditions under which to conduct a prescribed burn in the forest. Teams of students also completed field training, followed by a field test, to assess their technical forestry knowledge and data collecting skills. “Our students had a wonderful time and participated in real-life forestry training that they will never forget,” CAMS teacher Matt Gold said. 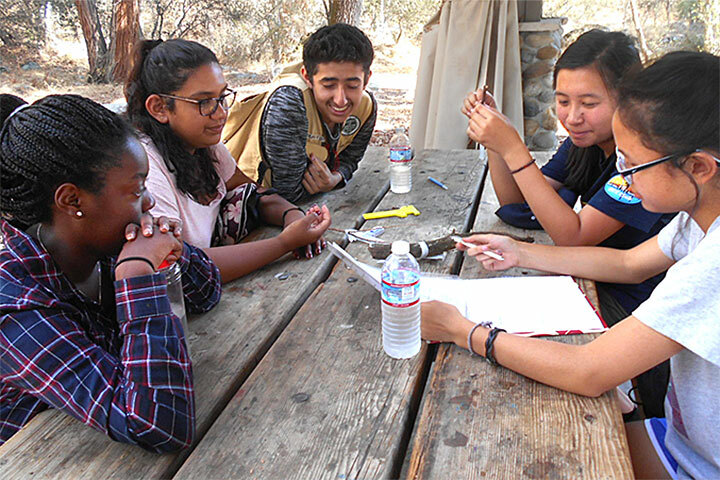 FORESTRY CHALLENGE – California Academy of Mathematics and Science students participate in field testing at the 2015 Sequoia Forestry Challenge, held near Springville, CA. Students used computer modeling to analyze fire conditions.